Good evening everyone! I hope you are all having a fantastic Monday! Tonight I am dropping in to share a fun mani I created that basically described my brain at this month…..on continues loop of all the things I need to do for closing on my new home. There is just so much to do to get things ready and doing that while pulling 10 hour shifts at work, home chores, and blog work….my mind is spinning! 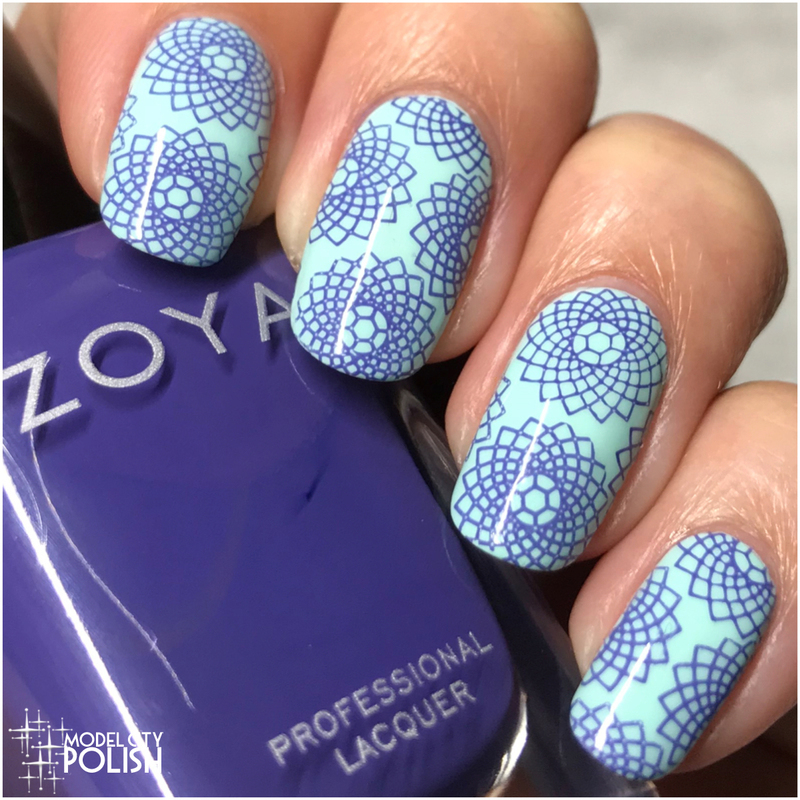 For my spirograph mani I started off with three coats of At Vase Value by China Glaze. I absolutely love this shade and the formula is perfection. 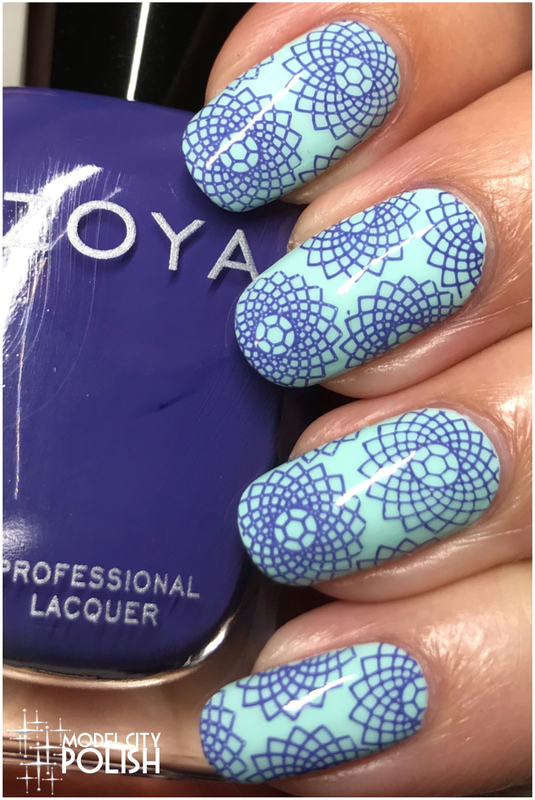 Next I used Danielle by Zoya along with the Femme Fatale plate by Moyra to create my continuous loop spirograph. Everything is sealed with two coats of Marvel Liquid Macro Top Coat by SuperChic Lacquer. So what do you guys think of my Spirograph mani? I am so in love with the color combo!!! I could see creating this one again for sure! Thank you so much for stopping by today and I will see you all again tomorrow….crazy schedule allowing of course! I love the color combo and the stamping!! The color combo is spot on. Love it! Ah! I love this design and colour combo! Great choice in colours- this combination is glorious! I love the stamping as well! I remember those spirographs, and used to make my own wrapping paper with those! This is so perfect and intricate. Love the Summery colours. When I was young my Spirograph was my favorite toy. I loved using it so I really love it on your nails. These are so neat! Always loved changing pen colors when using a Spirograph! Love this color combo and the design is so neat too! These nails are beautiful and so unique! I loved spirograph as a kid so I find the designs really pretty. I am in love ! You do amazing work. Wow that is incredible! My nails always break, so I rarely can do anything fun like this! You are very talented. I love the color combo. I really like this pattern you choose. Great work. Thanks for sharing this. This is awesome! I absolutely love the design you did and colors- they go together so well. Are these press ons? How did you do the art? Beautiful mani! I’m loving that stamp! That is some very nice work! Zoya lookslike that is the brand to get! Wow, they look so beautiful and striking, can’t believe you do them yourself! What a beautiful nails. They look gorgeous and so very pretty. OMG I’m totally obsessed! all your nail designs are just so lovely!